Maybe it was the bright white of the daikon or the fat haksai (Chinese cabbage) loitering on the table that first caught my eye, but the result was the same as usual: we stopped for a closer look. 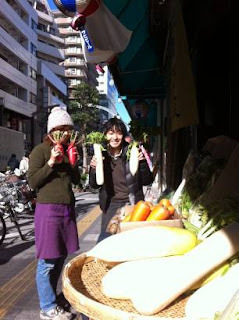 Out on one of our urban hikes earlier this week in our Tokyo neighborhood, we found a new vegetable venture. The Mitaka Vegetable Store, opened just recently by Satoru and Mikiko, does something so simple it borders on the profound. In a day and age when it is easy to find tomatoes from Okinawa, apples from Yamanashi, or potatoes from Hokkaido in the local supermarket, these two showcase produce from the nearby urban farmscape. Carrots, komatsuna, and small red daikon join the aforementioned vegetables to make a small but splendid display of winter produce. Sourced from conventional as well as organic farms (including the organic family farm C-Cafe partners with for its monthly organic buffet), the store sells Mitaka vegetables to Mitaka citizens. "Mitaka has many good vegetables and farmers, and people don't know," said Satoru when I asked him why they decided to start their business. And I couldn't agree more. While I love the abundance of Tokyo farmer's markets and the amazing people I meet there, I also often wonder why Tokyo farmers aren't represented. Even in Kichijoji's market, one train station east of where I stood talking with Mikiko and Satoru, there wasn't a grower or producer from the neighborhood that I could find. It seemed mildly absurd to me that one of Tokyo's greatest resources - it's urban farmers and their fantastic offerings - weren't represented. When I talk to my farmers about this, they say they don't see the point in carting their harvest to a far-away market (it would be at least a forty minute drive even to the Earth Day Market in Yoyogi Park or the UN University Market near Shibuya) when they can sell directly to the community from a vegetable stand. "We can talk with the customers and build a relationship," they said one day as we harvested haksai for delivery to our nearby Ito Yokado. The surplus that the big supermarket won't take lands at a table just outside the farmhouse gate where it gets snapped up almost immediately by passers-by. Those in the know venture one block over to find us in the greenhouse or field for a chat and to sometimes even choose for themselves. These visits result in conversations about the weather, cooking, family, current events, and even the occasional bit of gossip. There aren't so many farms left in Tokyo, but I'm a firm believer that we should support those that are still here and keep them in business. 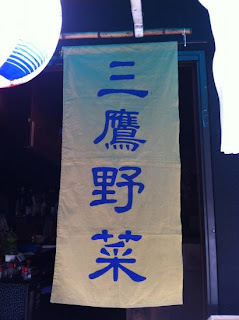 Not only are they are unique feature of our cityscape and a living segment of history (farmers were encouraged to settle the Tamagawa plain during the Edo Period to feed the city's growing population), but they are something to bank on for a future in a country with a low food-security rate and declining population of farmers. And there's nothing so delightful as finding a field of eggplant, trellised kiwi vines heavy with fruit, or nashi orchard in full bloom in a sea of concrete and glass. Thanks! They are really an extraordinary pair. I'm looking forward to catching up with them when we get back from Hokkaido.